Bubble Play, originally uploaded by Lukasmummy. Credits: Layered template (August Template Challenge) by Little Green Frog Designs and Stop Bugging Me by Jen C Designs. Font is Old Newspaper Types. Created for the June Blast From The Past Challenge at DSDI. Me On A Trip To The Beach, originally uploaded by Lukasmummy. Credits: Layered template (Paper Pieces, Template 1) and Me Me Me all by Jen C Designs. Enabling: Paper Pieces Templates are currently available as part of the June Template Grab Bag here, here, here and here and Me Me Me is available here, here, here and here. My Wedding Bouquet, originally uploaded by Lukasmummy. Credits: Layered template (Chopped Up, Template 4) and It’s Coming both by Jen C Designs. Font is Pea Crisby Funky by Amanda Bottoms (Fonts For Peas). Journalling reads: For most people a shot of the bride’s bouquet is one of the many standard wedding photos. But when have I ever been like most normal people. I managed to forget my bouquet in the rush to get to the registry office on time. We never even realised until it came to taking photos outside We ended up making a detour back home on the way to our wedding reception to grab it. Enabling: Chopped Up Templates are currently available as part of the June Template Grab Bag here, here, here and here and It’s Coming is available here, here, here and here. You can download Pea Crisby Funky here. Cleaning Your Room, originally uploaded by Lukasmummy. Credits: Layered template (Just Journaling Volume 1, Template 4) by Jen C Designs and CU Scallop Mats, CU Basics Scallop Templates, Spring Cleaning, P365 Date Rounds and Staple from All About Me Volume 1 all by Laura White (C.W Picket & Company). Fonts are Pea Bandit by Amanda Bottoms (Fonts For Peas) and Blackoak Std. Journalling reads: There are really only so many times that I can say the same thing over and over again, before even I am sick of the sound of my own voice saying it. In this house the most common of those phrases is “TIDY YOUR ROOM!!”. It’s a long standing battle I nag, you go up to your room, you play/watch tv and do everything except actually tidy up. I come up to check on you and end up telling you off. It usually ends with at least one of us in tears. Well I got so sick of this that I decided to just do it one day while you were at school. When you got home you were thrilled and thanked me. Or at least you did at first, you changed your mind once you realised, that those 2 huge black sacks of rubbish had some toys in that you didn’t want thrown away! Hopefully this taught you a valuable lesson like why you should tidy up your own bedroom and decide what is rubbish! Enabling: Just Journaling Templates by Jen C Designs available here, here, here and here, CU Scallop Mats available here, CU Basics Scallop Templates available here, Spring Cleaning available here, P365 Date Rounds available here and Staple from All About Me Volume 1 available here. Thank you For Loving Me, originally uploaded by Lukasmummy. 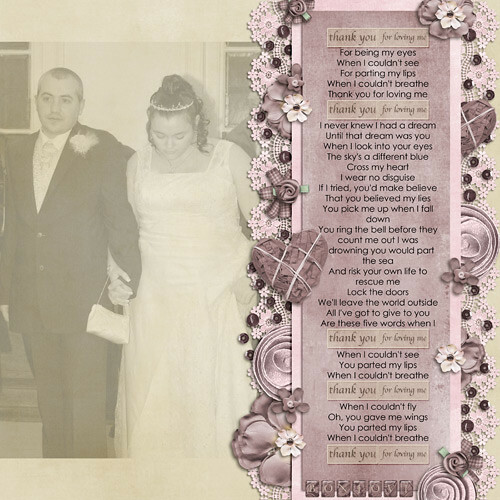 Credits: Layered template (Just Journaling Volume 1, Template 3) and Timeless (some slight recolouring) by Jen C Designs. Font is Century Gothic. Lyrics are to Thank You For Loving Me by Bon Jovi. Me & My Baby, originally uploaded by Lukasmummy. 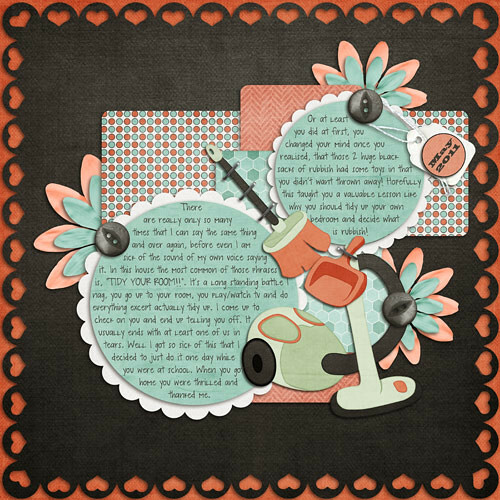 Credits: Layered template (Member Spotlight May, Scrapingramma, rotated 90 degrees) by Jayedid Designs and A Mothers Love, Bunch Of Buttons, Doodled Patterns, Lightly Folded 2 and Ribbons all by Jen C Designs. Font is Copperplate Gothic Bold. Enabling: Template available as part of a challenge at Scrap Orchard here, A Mothers Love was previously an iNSD Daily Download freebie on Jen’s Blog but is now available here, here, here and here, All of the following items were included in the grab bags Jen released for National Scrapbooking Day, Bunch Of Buttons is now available here, here, here and here, Doodled Patterns is now available here, here, here and here, Lightly Folded 2 is now available here, here, here and here and Ribbons is now available here, here, here and here. Tantrum In The Travel Cot, originally uploaded by Lukasmummy. Credits: Layered template (Multi Photo, Template 4) and Having A Bad Day both by Jen C Designs. Font is Prestige Elite Std. Enabling: Multi Photo Templates available here, here, here and here and Having A Bad Day was released as part of the Soda Shoppe Colour Pop at DSDI here in individual parts but the full kits is also available here. Not A Happy Boy, originally uploaded by Lukasmummy. Credits: Layered template (Singular Focus, Template 4) and Having A Bad Day both by Jen C Designs. Font is Pea Stacy by Amanda Bottoms (Fonts For Peas). Journalling reads: This photo of you makes me giggle, you are normally such a happy little boy, I only wish I knew why you were so cross at me! Enabling: Singular Focus Templates available here, here, here and here and Having A Bad Day was released as part of the Soda Shoppe Colour Pop at DSDI here in individual parts but the full kits is also available here. Be Unique, Be You, Be Yourself, originally uploaded by Lukasmummy. Credits: Layered template (Peek A Boo Templates, Template 2) and Bee Yourself both by Jen C Designs. Font is sf Tick Tock by Sugar Frog Fonts. Journalling reads: Why is it that with all of the toys you have in the house, you still prefer to sit on the floor and play with Nana’s beads? Why do those same beads seem to taste so yummy to you? I guess it is just yet another one of those bizarre little quirks that make you such a unique, fun little person. I don’t think I could ever bring myself to change a single thing about you, I love you just the way you are my strange crazy Logan. Enabling: Peek A Boo Templates available here, here, here and here and Bee Yourself currently available as part of the iNSD Mini Grab Bag exclusively at Funky Playground Designs here. You can download the font here. Love You Forever Logan, originally uploaded by Lukasmummy. 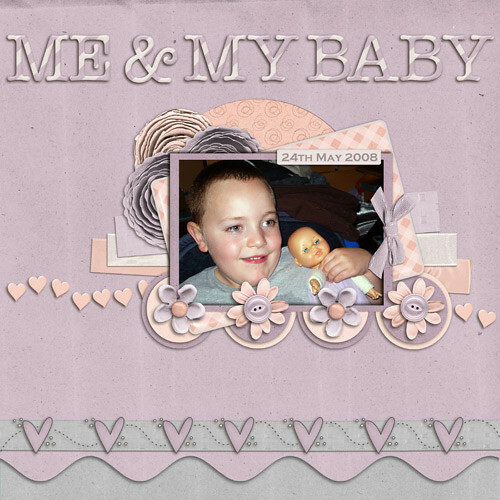 Credits: Layered template (Multi Photo Templates, Template 1) and I Love My Boy both by Jen C Designs. Enabling: Multi Photo Templates available here, here, here and here and I Love My Boy available here, here, here and here.